Aboriginal Health Research @NHMRC Road Map 3: A Strategic Framework for Improving Aboriginal Health through Research for public consultation. 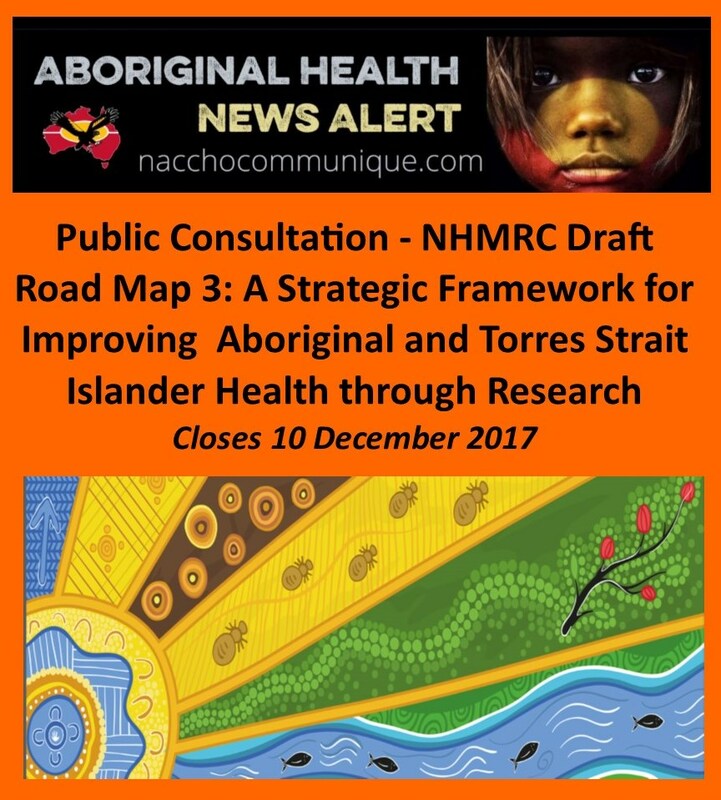 The National Health and Medical Research Council (NHMRC) has released the draft Road Map 3: A Strategic Framework for Improving Aboriginal and Torres Strait Islander Health through Research (Road Map 3) for public consultation. Seek feedback on the inclusion of an Action Plan. NHMRC has committed to develop Road Map 3 to guide and communicate its objectives and investment in Aboriginal and Torres Strait Islander health research for the next decade. Road Map 3 builds on the previous documents, Road Map I (2002) and Road Map II (2010). From March to July 2017, the NHMRC and its Principal Committee Indigenous Caucus (PCIC) worked with Nous Group (Nous) to conduct a national consultation process for the development of Road Map 3. The consultation process for Road Map 3 began with a series of interviews with nine leaders from Aboriginal and Torres Strait Islander health and research peak bodies. This was followed by seven workshops across Australia attended by researchers, health workers, government officials and community leaders. An online survey was also made available for those who could not attend the workshops. NHMRC is seeking responses to a series of questions related to the development of Road Map 3. Is the proposed objective of Road Map 3 relevant? Why/why not? Are the three priority areas of Road Map 3 accurate? Why/why not? Are there any further priority areas to add? Is there anything missing from Road Map 3? Please provide further details. Are there any other comments you would like to make regarding Road Map 3? Extensions will not be provided. Please note: These documents are for information only and are not open for public consultation. Please note: If you are having problems downloading a document, please right-click on the link and select “Save Target/Link as…” and choose a location to save the file to. Please provide your contact details: Name, Organisation (if relevant), Email, and Phone number. This information will not be used or disclosed for any other purpose. Due consideration will be given to submissions that address the public consultation questions and provide additional evidence that meets the inclusion criteria. NHMRC’s Principal Committee Indigenous Caucus (PCIC) will provide advice to NHMRC on responses received. After the final document Road Map 3 is released, submissions may be made publicly available via the NHMRC online public consultation portal, unless they have been requested NOT to be published.